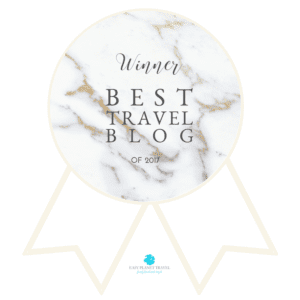 Rio is known for its famous beaches, thrilling carnival, awesome nature and unparalleled landscape dotted with huge mountains that leaves everyone in awe. One of those mountains is Pedra da Gavea, (Stone of Gavea) is a huge mountain that stands 844 m (2,769 ft) above sea level and is one of the highest mountains in the world that ends directly in the ocean. 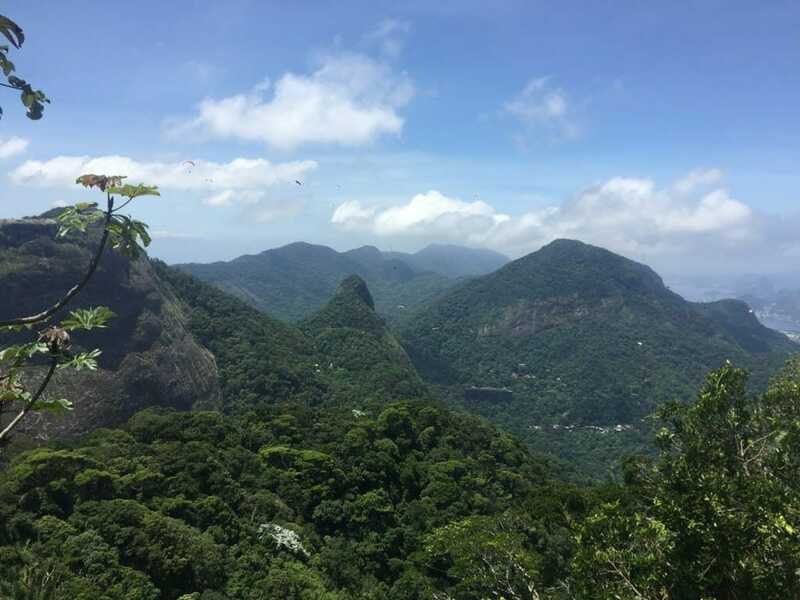 It is located in the western part of Rio, within Tijuca National Park, the biggest urban forest in the world. This mountain is full of legends, from Phoenicians (because of some “inscriptions” found by researchers) to aliens (some people believe there is a portal that transports them to another world). 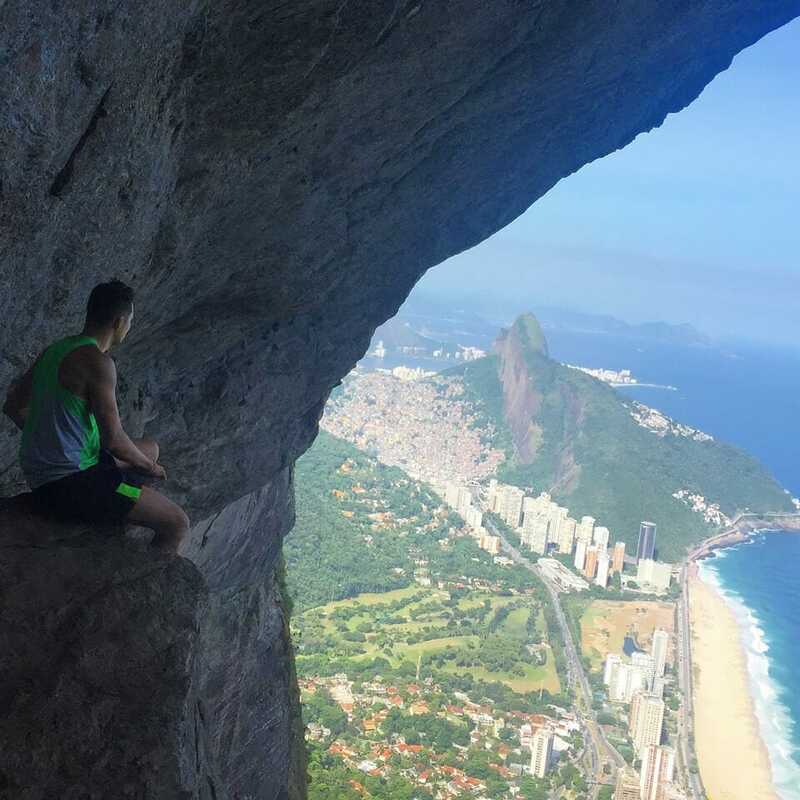 However Pedra da Gavea is not considered an archeological site, it attracts thousand of adventure seekers and nature lovers to enjoy one of the most rewarding hikes in Rio. 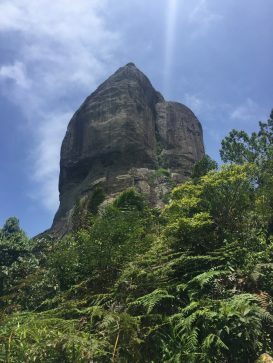 Pedra da Gavea hike has been on my list for a while, not only for the incredible views, but also for being considered one of the most difficult hikes in Rio. 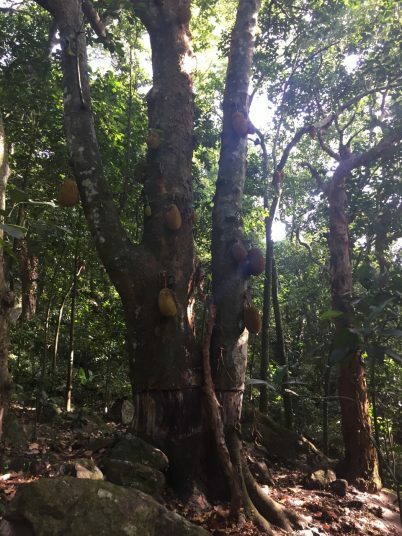 I left the place that I was staying in Ipanema and took the bus number 557 to Rio das Pedras, and got off close to Estrada do Sorimã near to Tijuca National Park – C Section. The weather was perfect for a hike. Rio gets extremely hot during the summer and temperatures can easily reach 40 C (104 F). But that February 13th of 2016 it was nice. 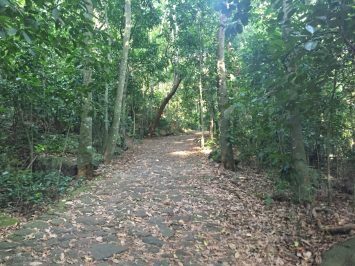 After a short walk through a beautiful and secluded neighborhood surrounded by exuberant vegetation, I reached the park booth ranger, asked some questions and followed the path. The beginning of the hike is very easy and you walk on a cobblestone street, but the path suddenly disappears and there are no signs, no clear path to follow. Moved by gut feeling, I walked on what looked like a trail on a terrain full of roots of huge and beautiful trees. It was easy indeed, but five minutes later I was drenched! And the worst part was, I did not have a backpack, just a water bottle for a five hours hike. So stupid! 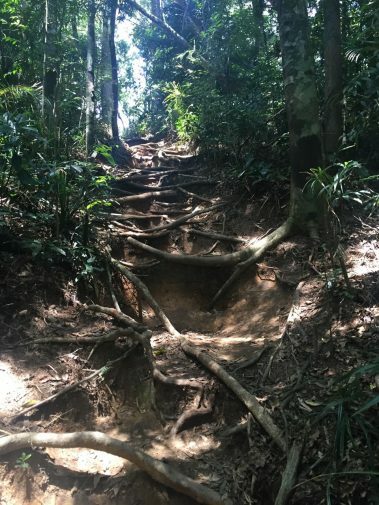 Besides the fear of snakes, this hike is inside an Atlantic Forest and I even saw some monkeys, I was also scared of getting lost, which happens all the time in this park. Some parts I didn’t know where to go, but luckily some people were coming down and helped me find my way. 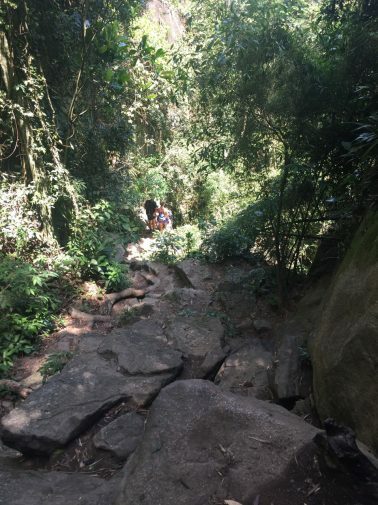 The surface changed for a while in some parts, with some rocks making up a kind of stair that helps to climb a hill with a small waterfall by its side. Time to refresh a little bit and keep climbing. The ascension on this 2600 m (1.6 mi) long hike is completely fine and after around one hour I arrived at Praça da Bandeira (Flag’s Square), and a few steps further along the trail it started to unveil its rewards. 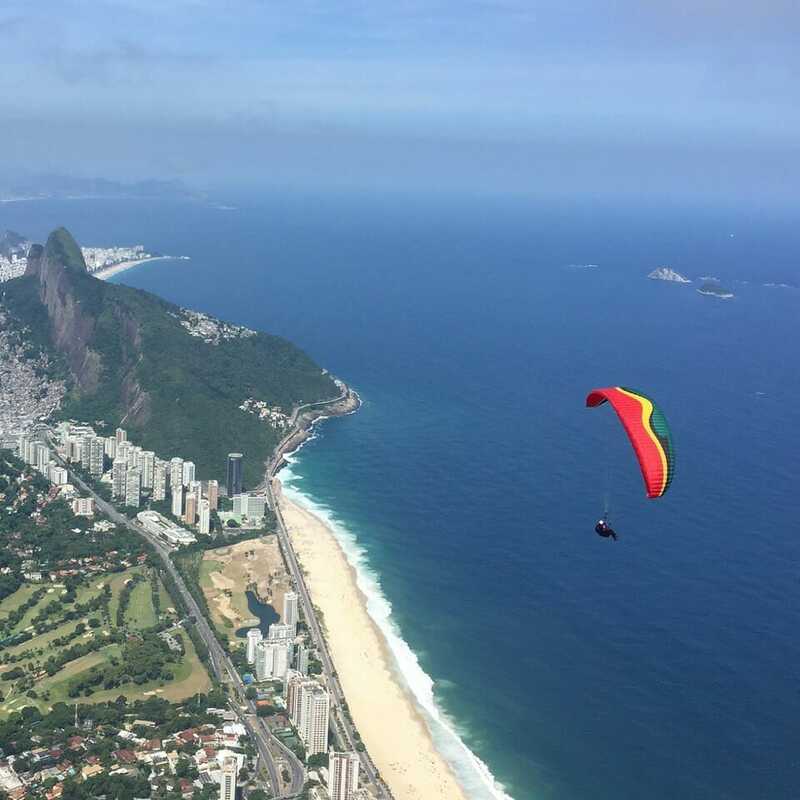 What an awesome view of Pedra Bonita (a famous point for paragliding)! The view here is hallmarked by extraordinary vegetation and beautiful blue sky. Beyond this part there is basically no more shade and the terrain becomes brownish and powdery. You can see the Cabeça do Imperador (Emperor’s head) a huge mountain that is also part of this chain, and some parts of Rio’s west zone. After 10min walking I arrived at the “infamous” and fearful Carrasqueira: a 35m (115 ft) rock wall that you have to climb without any equipment. I smashed my almost empty water bottle, put it into my pocket, plus cell phone and wallet… and I started to climb the rock wall. Five minutes later it was done. After that I walked a little more, this time to the top of a plateau. Pedra da Gavea was covered with clouds and I could barely see anything. But the clouds were moving very fast and finally after 1:30 of hiking I had one of the most breathtaking views of Rio that I had ever seen. 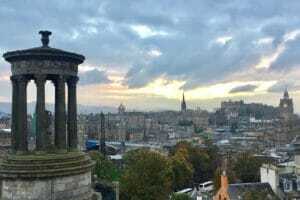 I felt like I was on the top of the city, everything seemed so small. 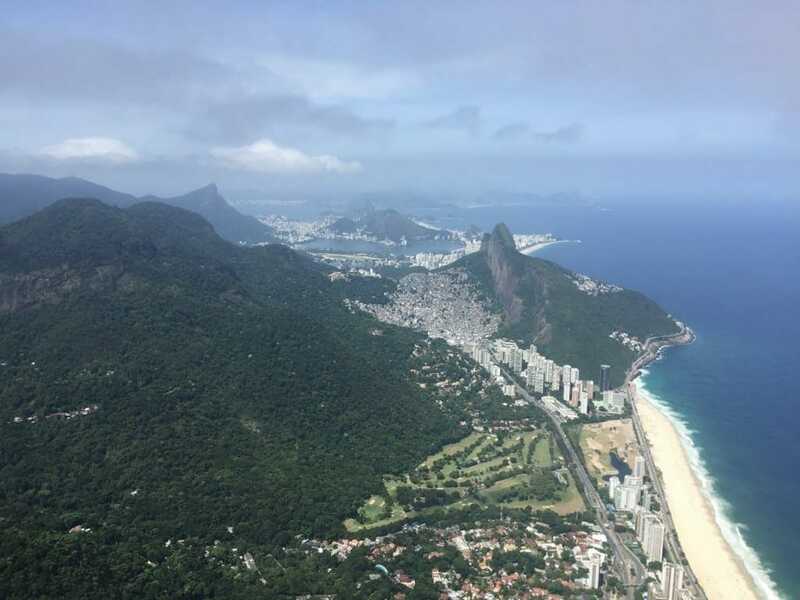 Rio looked like a handcrafted city designed by an extremely passionate nature lover who was able to translate the waves’ shapes from Rio’s beautiful beaches into the green chain of mountains. I spent some time waiting for the sky to clear up again, admiring the landscape and watching paragliders playing “hide and seek” in high speed just underneath my feet. 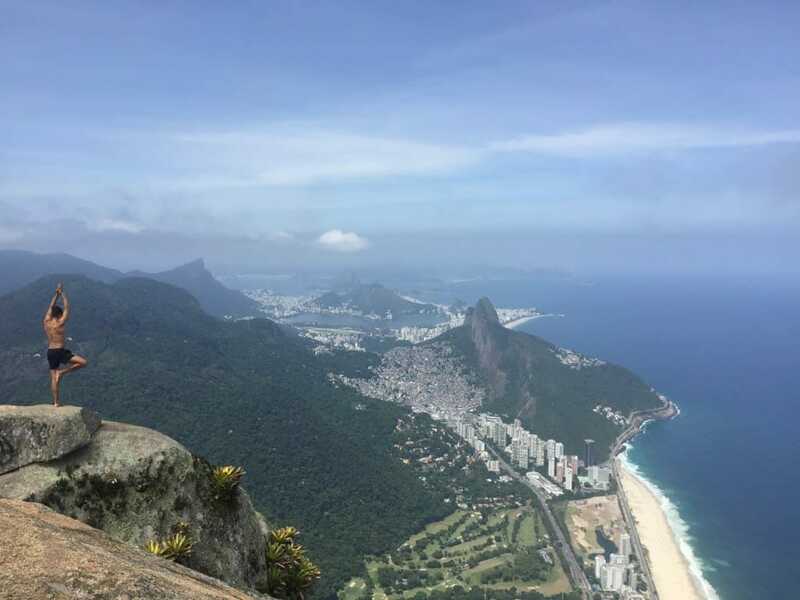 The feeling of being on the top of Pedra da Gávea was marvelous!! I spoke with people form the U.S., Turkey and of course Brazil, who were also doing this hike. A Brazilian group invited me to go down with them by another route: the P4. On this route you don’t go via Carrasaqueira and you use a stainless steel cable attached to another challenging rock wall instead. But the P4 route was harder than the first one, and I was just able to get down because one of the guys knew the way. It was so slippery and in many parts I had to bend my knees to pass underneath the trees. The good thing was the view, because most of the time you faced the ocean. There were two rock walls with chains, and in one of them the chain was incomplete and did not go all the way to the ground. However everyone, girls and guys, young and not that young, made it. I choose the P4 route not only to escape from the Carrasqueira (I believe to go down would have been hard for me), but specially to see an interesting rock formation with a rectangular crop that looks like a door, window or balcony, called Portal da Pedra da Gávea. The portal seemed impossible to find but after almost an hour lead by the “guide” of our group we found it, and the view was quite intriguing. It’s a partial view but yet stunning! After snapping some pictures I decided to go down by myself because there was a very slow guy in the group and I was hungry and wanted to enjoy the pool with some friends after the hike. On the way down by myself I had the same feelings: fear of snakes and getting lost. And because I chose another route, everything seemed so new and unfamiliar… But finally after 2:30 I crossed the gate. 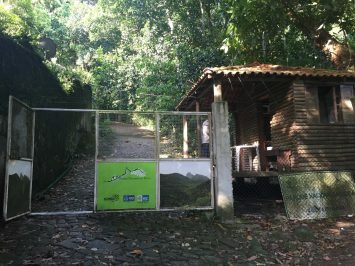 The Pedra da Gavea hike is open only from 8:00 AM to 5:00 PM (6:00 PM in the summer), but even though it was almost 6:00 I bumped into many people going up and even to someone who was just starting. I finally had lunch in the neighborhood and took the bus back to Ipanema. At night I went to the carnival and I don’t know how I had energy to stay up. 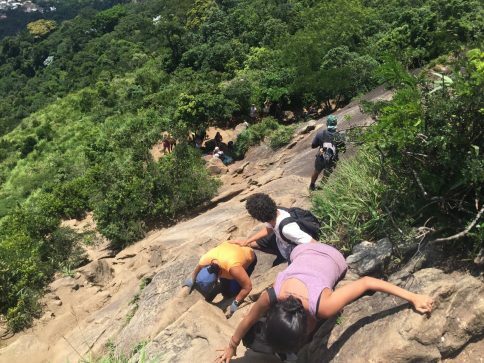 The Pedra da Gavea hike is much more than a physical challenge, it provides the opportunity to be fully connected with nature and appreciate even more this magnificent city. ∗ Over 12 airlines fly to Rio, some of then are: Delta, AirFrance, KLM, British Airways, Iberia and Emirates. ∗ From Ipanema to Rio das Pedras: local bus number 557. 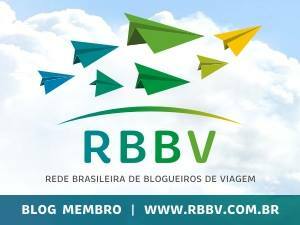 ∗ Bus São Paulo-Rio with Expresso Brasileiro: R$ 84.00 (US$ 22), each way. ∗ Local Bus: R$ 3.80 (around US$ 1). For more information about Rio de Janeiro visit the page: Visit.Rio.